For Squat, Bench or Dead Lift. The OKIE DeadLift Bar (20kg) has been used in numerous local, state, regional, national, world & international competitions. 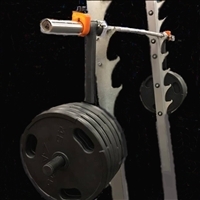 Designed by 700lb DeadLifter, Rickey Dale Crain this bar was the 1st of its kind and is made to the maximum length and the minimum diameter to create the BIGGEST SPRING off the floor possible. It is also made from a steel that allows for a monumental amount of REBOUND and with a special patterned, pitched and shaped knurling for the BEST GRIP possible. For Squat, Bench or Dead Lift, but recommended for Squat..